Richardus JH, Pahan D, Johnson RC, Smith WCS. 18 September 2016, posting date. Leprosy control. In Scollard DM, Gillis TP (ed), International textbook of leprosy. www.internationaltextbookofleprosy.org. The basic intervention strategy in leprosy control is multidrug therapy (MDT; see Chapter 2.6), given to newly found leprosy cases. Preventive interventions, other than awareness raising and health education activities, are not routinely available. Yet it has long been argued that the elimination of leprosy cannot be achieved by a strategy based on MDT alone and that new tools and technologies are needed to attain this goal . Intensified, population-based approaches to case detection are no longer cost-effective, and a new approach is indicated that is appropriate to the current epidemiological situation. New cases are relatively rare even in endemic countries; health care resources are scarce with many competing demands; and leprosy control activities are difficult to sustain within integrated programs. The main risk of exposure to leprosy is close contact with new, untreated cases. As the risk of exposure to leprosy in the general community is very low, an increasing proportion of new cases will be from household contacts . Over the past few years, progress has been made in the areas of chemoprophylaxis and immunoprophylaxis to prevent leprosy, and these interventions have focused primarily on contacts of leprosy patients. The Bacillus Calmette-Guérin (BCG) vaccination was originally developed as a vaccine against tuberculosis (TB), and it has been used extensively all over the world for decades for this purpose. At an early stage, it was recognized that BCG could possibly also protect against leprosy and several vaccine trials followed using BCG, often in combination with M. leprae or related mycobacterium vaccines. Convit et al. conducted a trial in Venezuela in the 1980s using a combination of live BCG plus heat-killed M. leprae . In the same time period, a trial was conducted in Malawi comparing different regimens of the BCG vaccination, including the combination of BCG with heat-killed M. leprae . Both trials showed that BCG was effective, that repeated doses of BCG gave additional protection, and that the addition of heat-killed M. leprae did not offer more protection than the BCG alone. In the early 1990s, a large trial was conducted in South India  of four different vaccines: BCG; BCG plus heat-killed M. leprae; the ICRC vaccine, made from cultivable leprosy-derived mycobacteria, probably belonging to the M. avium intracellulare complex prepared at the Indian Cancer Research Center ; and “Mycobacterium w (Mw)”, a vaccine from India prepared from Mycobacterium welchii . In this study, the BCG plus the heat-killed M. leprae provided 64% protection; ICRC provided 65.5% protection; Mw provided 25.7% protection; and BCG alone provided 34.1% protection. Another trial in India in the 1990s among household contacts of leprosy patients used the Mw vaccine . For these contacts, the Mw vaccine showed a protective efficacy of 68.6% at 3 years, 59% at 6 years, and 39.3% at 9 years follow-up, indicating the need for a booster vaccination after 7–8 years. Finally, in Vietnam in the 1990s, three vaccines, BCG alone, BCG plus 107 killed Mycobacterium vaccae, and 108 killed M. vaccae alone, were studied in children living in close contact with leprosy . For all three vaccines, there was 52.5% protection for the first 4 years and 80.5% for the second 4 years. There were no significant differences in protection afforded by each of the vaccines, but the authors viewed the success of the killed preparation of M. vaccae to be an important finding (see Chapter 6.4). Meta-analyses have supported the protective effect of BCG against leprosy , , . In the most recent review, Merle et al. described the variable protection, ranging from 20 to 90%, of the BCG vaccination against leprosy in different study sites. They found that there is evidence of protection when the vaccine is given at a young age, but that there are inconsistent results when it is given at an older age. There is also some evidence, although inconsistent, regarding the benefit of revaccination. The BCG efficacy was found to be larger in observational studies than in trials: 60% versus 41%. The only variable that significantly explained the heterogeneity of the results after adjustment was the target population of the study, specifically, whether it consisted of contacts of leprosy cases or the general population. BCG efficacy appeared to be significantly higher among contacts of leprosy patients than among the general population: 68% versus 53%  (see Chapter 6.2; Chapter 6.3). It can be concluded that, to date, BCG is the best available vaccine for the prevention of leprosy. In Brazil, in addition to routine BCG vaccinations given at birth for TB, BCG has been officially recommended for household contacts of leprosy cases since the early 1970s. Since 1991, the Brazilian Ministry of Health also has advised that two doses of BCG be administered to both current household contacts and contacts whose index (original) cases were diagnosed within the previous 5 years. The vaccine is administered irrespective of TB or leprosy skin test results. If the contact never received BCG, or if this information is unknown, the contact receives two BCG doses at a 6-month interval. If the contact has already received one dose of BCG, a single dose is given . This policy was assessed in a cohort study of 3,536 contacts of 1,161 leprosy patients in Brazil, which showed that a booster BCG vaccination conferred 56% protective efficacy and that that percentage was not substantially affected by previous BCG vaccination . During 18 years of contact follow-up, it was observed that among the 122 new cases detected, leprosy was diagnosed in 28 (23%) relatively soon after vaccination (2–10 months). This observation raises the question of whether the BCG vaccination actually induces symptoms of leprosy in people already incubating the disease. An ongoing randomized, controlled trial in Bangladesh is studying the effectiveness of the BCG vaccine versus the BCG in combination with a single dose of rifampin (SDR) given 2 to 3 months later in the prevention of leprosy among contacts of newly diagnosed leprosy patients . In this study, 21 contacts of the 5,196 vaccinated contacts (0.40%) developed leprosy within 12 weeks after the BCG vaccination. All 21 cases presented with paucibacillary (PB) leprosy, including children and adults . About half of these cases had previously received the BCG vaccination, as indicated by the presence of a BCG scar; 43% presented with signs of nerve function impairment and/or Type 1 (reversal) reaction; and 56% of the index patients had multibacillary (MB) leprosy. The question is whether the BCG vaccination of contacts merely altered the incubation period or actually changed the course of the infection from self-limiting, sub-clinical infection to manifest leprosy disease. Further studies are ongoing in Bangladesh to elicit the underlying immunological mechanisms. Duthie et al. state that the ideal vaccine against leprosy would induce strong, long-lasting T-cell responses directed against M. leprae that would both prevent disease and reduce bacterial transmission . An effective sub-unit vaccine has not yet been found (although it is currently under development). The selection and production of recombinant antigens has been simplified by the completion and publication of the M. leprae genome in 2001 . Antigens have been identified (see Chapter 7.1; Chapter 6.4) that also are recognized by PB patients and stimulate IFN-γ secretion , , . The Infectious Disease Research Institute (IDRI), supported by the American Leprosy Missions (ALM), is currently assessing the vaccine potential of several of these antigens by experimental vaccination and infection in mice , . IDRI envisions leprosy vaccines to be used in interventions targeted at specific risk groups, such as household contacts (not whole populations), and possibly also as therapeutic vaccines (or immune therapy) for patients in conjunction with chemotherapy  (see Chapter 6.4). The idea of chemoprophylaxis in leprosy is not new. In the 1960s and 1970s, trials were carried out in Uganda employing dapsone as chemoprophylaxis among school children , and in India employing dapsone among whole populations of endemic villages  and child contacts of non-lepromatous and lepromatous leprosy patients , , , , . Dapsone was given regularly, usually in a weekly dose, for 2 or 3 years. These studies were followed by trials with acedapsone, which was given less often and for a shorter duration (every 10 weeks over 7 months) , . A meta-analysis of three eligible studies using dapsone , ,  significantly favored dapsone to the placebo (4,337 participants, RR 0.60, 95% CI 0.48–0.76; indicating an overall reduction of leprosy among contacts of 40%). Similarly, a meta-analysis of two eligible studies using acedapsone ,  significantly favored acedapsone to the placebo (1,259 participants, RR 0.49, 95% CI 0.33–0.72; indicating an overall reduction of leprosy among contacts of 51%) . In 1988, a chemoprophylaxis study employing a single 25 mg/kg dose of rifampin was conducted in the Southern Marquesas Islands , , . This non-controlled trial treated 2,751 of the 2,786 (98.7%) inhabitants of the islands. In addition, 3,144 South Marquesans living elsewhere in French Polynesia were given the same chemoprophylaxis. Over the following 10 years, five cases were detected in the treated population, a number significantly smaller than the 17 cases that were predicted, based on the assumption that the case detection would have remained stable over the years without chemoprophylaxis. This finding suggested that the intervention was 70% effective. However, over the 10 years following the implementation of the chemoprophylaxis program, the detection rate in the Polynesian population that was not given the intervention declined by about 50%, suggesting an effectiveness of the chemoprophylaxis of only 35–40%. Because of the high leprosy incidence rate in the Pacific islands, it was decided in the mid-1990s to carry out programs of chemoprophylaxis in the Federated States of Micronesia, Kiribati, and the Republic of the Marshall Islands . Around 70% of the population of the countries was screened for leprosy twice within a one-year interval, and chemoprophylaxis was administered to all healthy individuals once during each round. The combination of rifampin-ofloxacin-minocycline (ROM) was given to adults and rifampin only to children under 15 years of age . By 1999, a substantial reduction in case detection was observed, but it could not be established whether transmission of M. leprae in the population had been interrupted by the intervention . Recent prevalence and new case detection figures indicate that the intervention did not interrupt transmission. The Federated States of Micronesia and the Marshall Islands never reached the WHO leprosy elimination target, while Kiribati failed to maintain the elimination threshold . In 1999, a workshop was convened in Pohnpei (Federated States of Micronesia) to discuss the results of the chemoprophylaxis trials in the Western Pacific region and the prevention of leprosy in general . At this workshop, Smith and Smith described the needs, opportunities, and feasibility of the preventive treatment of leprosy, including chemoprophylaxis and immunoprophylaxis . An important conclusion of the workshop was that further evidence of the effectiveness of these preventive interventions was required . In 2000, a chemoprophylaxis intervention study with rifampin was started on five Indonesian islands highly endemic for leprosy . The intervention consisted of two doses of 600 mg of rifampin for adults and 300 mg for children (6–14 years old), with approximately 3.5 months between doses. To form similarly sized intervention groups, three islands were combined into one intervention group. Two types of chemoprophylactic intervention strategies were compared with a control group. The blanket (complete population) group included three islands on which prophylaxis was given to all eligible persons. The contact group included an island on which prophylaxis was given to all eligible contacts of all known and newly found leprosy patients. The control group was the population of an island on which no chemoprophylaxis was given. The population was actively screened before the intervention and subsequently once a year for three years. The cohort consisted of 3,965 persons. The yearly incidence rate in the control group was 39/10,000; the cumulative incidence after three years was significantly lower in the blanket group. No difference was found between the contact and control groups. This study showed that population-based prophylaxis was associated with a reduced leprosy incidence in the first three years after implementation. The study also showed that in this area of high endemicity, rifampin prophylaxis for spatially defined contacts only (e.g., household members and neighbors) did not appear to influence leprosy incidence and that further studies, including social contacts, are needed to establish the effect of prophylaxis given to contacts in areas of lower endemicity. The results of this study were promising but inconclusive, due to limitations in design and sample size. The need for a more rigorous trial to determine the preventive effect of rifampin was met by the COLEP study conducted in Bangladesh . The objectives of this study were to determine empirically the effectiveness of chemoprophylaxis with a single dose of rifampin (SDR) in the prevention of leprosy among close contacts of leprosy patients, and to find the characteristics of the contact groups most at risk of developing clinical leprosy. COLEP was a single-center, double-blind, cluster-randomized, placebo-controlled trial, using the total contact group of a patient to determine the factors characterizing the sub-groups most at risk. In addition, a reference group was formed from the general population to determine the prevalence and incidence of leprosy in the total population of the study area . In total, 28,092 close contacts of 1,037 patients with newly diagnosed leprosy were included in the trial, of which 21,711 contacts fulfilled the study requirements. Of the 21,711 contacts, 18,869 (86.9%) were followed up at two and four years. Ninety-one of 9,452 contacts in the placebo group and 59 of 9,417 in the rifampin group had developed leprosy at four years. The overall reduction in the incidence of leprosy using SDR in the first two years was 57% (95% CI: 33–72%) . The groups did not differ between two and four years , or in a follow-up study at six years . The overall number needed to treat (NNT) to prevent a single case of leprosy among contacts was 297 (95% CI: 176–537). The trial showed that SDR given to contacts of patients with newly diagnosed leprosy is effective at preventing the development of clinical leprosy at two years. The initial protective effect was maintained, but no difference in incidence was seen between the placebo and rifampin groups beyond two years , . The COLEP study made clear distinctions in the characteristics of contacts with regard to genetic and physical distance to the original leprosy patient (index). Further interesting findings concerned the effect of SDR in relation to contact level. Firstly, the effect of the SDR depended on the contact level . The effect was larger if the contact was not blood-related to the index patient, if the index patient had PB leprosy, and if the contact was a social contact rather than a household contact or neighbor. In other words, the effect of SDR is highest in those contact groups with the lowest a priori risk for leprosy (i.e., those who are probably genetically less susceptible and those who are further removed from the index patient and therefore less exposed). Secondly, the effect of the SDR depended on the BCG status of the contact . If the contact had received a BCG vaccination as part of a childhood vaccination program (as established by the presence of a BCG scar), the protective effect of SDR was 80% (Table 1). Both childhood BCG vaccination and SDR have a protective effect for leprosy in contacts (each conveyed through different biological mechanisms) of nearly 60%, but if a contact who had previously received a BCG vaccination also received SDR, the protective effect appears to be additive to the effect of BCG. In 2014, an expert group reviewed the evidence for chemoprophylaxis in contacts and high-risk communities . The group also considered the definitions of ‘contact’ and ‘contact tracing’; discussed alternative prophylaxis regimens, the preliminary findings of operational pilot projects on post-exposure prophylaxis (PEP) in Indonesia, and the development of diagnostic tools; and identified the priority questions for operational research in leprosy transmission. A large, international program of pilot projects (the LPEP project) has been launched by the Novartis Foundation, in collaboration with several national leprosy programs and other partners of the International Federation of Leprosy Associations (ILEP), to assess the effect of chemoprophylaxis on the transmission of leprosy. The pilot projects are designed to demonstrate the feasibility, acceptability, cost-effectiveness, and real-world efficacy of contact tracing and PEP as a strategy for interrupting leprosy transmission. The projects are also intended to facilitate the integration of chemoprophylaxis experiences into national programs and guidelines, provide a toolkit for contact management and PEP, create locally adaptable surveillance and response systems for PEP, and demonstrate the cost-effectiveness of chemoprophylaxis. With new leprosy cases becoming relatively rare in most endemic countries, it is not feasible any more to apply intensified, population-based approaches to case detection and target preventive interventions such as chemoprophylaxis and immunoprophylaxis to total populations groups, possibly with the exception of small, highly endemic pockets of leprosy. As the main risk of exposure to leprosy is faced by close contacts of new, untreated cases and the risk of exposure to leprosy in the general community is very low, an increasing proportion of new cases will be from household contacts. Thus contacts should be the main focus of a future leprosy control strategy. Such a strategy would have three basic pillars: (1) case detection, (2) case management, and (3) contact management. Case detection and case management have been the major components of past and present leprosy control strategies, including activities such as early case detection, appropriate treatment of leprosy disease and leprosy related complications, prevention of disability, and social action for stigma reduction . Contact management includes contact tracing and possibly the provision of preventive interventions aimed at contacts. Contact surveys have usually been recommended in national and international guidelines and were routinely performed in the past, but they have long been neglected in many countries due to lack of resources. It has now become clear that a strategy of early case detection and treatment with MDT is not sufficient to interrupt the transmission of M. leprae and reduce the incidence of leprosy significantly , . Well-developed contact management approaches will provide the opportunity to apply preventive measures and reduce transmission in endemic communities. Contact management first consists of a contact survey upon the identification of a new leprosy patient. It has been well established that close contacts of leprosy patients have an increased risk for leprosy. The COLEP study showed that the chance of finding a household contact with previously undiagnosed leprosy was ten-fold compared to the general population (see Table 2) , . The chance of finding leprosy among different categories of neighbors and social contacts was also higher than that of the general population (between three and five-fold; see Table 2). The age of the contact, the disease classification (MB or PB) of the index patient, and the physical and genetic distance between them were independently associated with the risk of a contact acquiring leprosy. The conclusion of this study was that contact surveys for leprosy should not only focus on household contacts, but should also be extended, where possible, to neighbors and consanguineous relatives, especially when the patient has MB leprosy . A contact survey consists basically of either a home visit by (para) medical staff or an invitation to contacts of a new patient to visit a clinic. The contacts are examined for the presence of leprosy symptoms and given health information about leprosy. New cases found during a contact survey are started on MDT. A contact survey is an effective intervention in itself and, when done consistently in a control area, will probably contribute considerably to reducing the transmission of M. leprae in the community . At the time of the contact survey, it is possible to add preventive interventions targeted at contacts, such as chemoprophylaxis and immunoprophylaxis. Chemoprophylaxis provides a relatively short protective window (approximately 2 years). The studies on BCG protection in leprosy indicate an increased risk of tuberculoid leprosy in the first months after the BCG vaccination, but long-term protection afterwards. This finding suggests that a combined approach providing both chemoprophylaxis for immediate and short-term protection and immunoprophylaxis for long-term protection is an interesting option. However, Rifampin, a mycobactericidal drug, and BCG, containing live mycobacteria, cannot be given at the same time. In this case, two visits are necessary: immunization is provided during the first visit and chemoprophylaxis during a second visit after a number of weeks. A trial to assess the efficacy of a combined strategy is currently underway in Bangladesh . New generation sub-unit vaccines (see Chapter 6.4), which do not contain live bacteria, could solve this problem of separate applications of chemoprophylaxis and immunoprophylaxis . Trials of dapsone have indicated that mass chemoprophylaxis can be efficacious in preventing leprosy in high-risk populations. These studies are now only of historical interest, given that dapsone must be taken for a long time to achieve protection. Case studies from Micronesia, the Maldives, Indonesia, and French Polynesia have shown that blanket treatment of a population with rifampin or ROM is feasible and can achieve high coverage. These case studies showed that the number needed to treat (NNT) to prevent one case of leprosy depends on the protective effect of the prophylactic drug and the disease frequency, and that NNT is lower in high-endemicity areas. As a result, mass prophylaxis is most efficient in high-risk or high-endemicity populations . Linking blanket prophylaxis for leprosy to mass drug administration programs for other neglected tropical diseases (NTDs) may provide logistical advantages. It remains unproven whether mass revaccination with BCG can provide additional protection to blanket chemoprophylaxis in populations at a high risk of leprosy. Mass treatment with antibiotic drugs needs to be considered very carefully with regard to unconstrained use and the threat of drug resistance. Disease control is defined as the reduction of disease incidence, prevalence, intensity, morbidity, or mortality, or a combination of these, as a result of deliberate effort. Elimination, or the interruption of transmission, is the reduction to zero of the incidence of infection caused by a specific pathogen in a defined geographical area as a result of deliberate efforts. Eradication is the permanent reduction to zero of the worldwide incidence of infection caused by a specific pathogen as a result of deliberate efforts, with no risk of reintroduction . ‘Elimination as a public health problem’ is a separate concept from elimination and is based on the use of measureable targets for control set by the member states of the WHO. The ‘elimination as a public health problem’ strategy was approved in 1991 by a resolution of the World Health Assembly . The strategy was based on early case detection and MDT treatment and used a registered prevalence of less than 1 in 10,000 as the measureable target. The use of prevalence rather than incidence of disease as a target differed from the standard elimination target of incidence. However the strategy created a political and financial commitment to leprosy and focused programs on case detection and treatment. The strategy simplified the diagnosis and treatment of leprosy, which facilitated implementation in areas with a weak health care infrastructure. Important simplifications included diagnostic methods without slit skin smears, classification based on number of skin lesions, and the delivery of MDT in PB and MB blister packs for both adults and children. The strategy resulted in a reduction in the registered prevalence of leprosy by over 90%; however, there was no similar change in new case detection trends. The prevalence of a disease is equal to its incidence multiplied by its duration. Therefore, the effect of the ‘elimination as a public health problem’ strategy on prevalence was almost entirely due to the reduction in treatment duration. Before MDT, dapsone treatment was continued for between 4–10 years and, in some cases, for life. MDT reduced the treatment duration to fixed periods of 6 months for PB and, initially, 24 months for MB, later shortened to 12 months. Since 2000, the prevalence of leprosy has leveled off because MDT coverage has reached 100%. After all patients were receiving fixed duration, short course MDT, there was no longer any potential to further reduce prevalence by reducing treatment duration. Following the success of the leprosy elimination strategy, there was interest in considering the potential of the eradication of leprosy. The criteria for eradication are scientific feasibility, epidemiological vulnerability, effective intervention, and the demonstration of elimination. Political will and popular support, economic factors, and synergy with other interventions are important . The case for the eradication of leprosy does not meet the criteria for eradication on a number of grounds, particularly the lack of an effective, safe, and affordable means of preventing transmission of disease and a measure of infection. The approach to leprosy control since the advent of dapsone therapy in the 1950s has been that of secondary prevention, early case detection, and treatment. MDT was introduced in 1982  in the face of growing concern about emerging dapsone resistance. The introduction of MDT did not change the basic strategy of case detection and treatment, but it did result in shorter treatments. The reduction in the duration of treatment led to a decrease in registered prevalence that in turn stimulated the concept of elimination as a public health problem strategy. Early detection is difficult to define whereas late detection, after nerve function impairment has happened, is more obvious. Early detection of leprosy based on the presence of a small number of ill-defined skin lesions can be difficult to diagnose and attempts to promote very early detection may be associated with over-diagnosis. Early diagnosis and treatment before nerve function impairment has occurred is deemed to be an effective means of preventing disability. It may also reduce the opportunity for exposure and transmission of the M. leprae infection. Modeling suggests that early detection and treatment can contribute to reducing transmission . A delay in the detection of leprosy can be considered as both patient-based and health system-based . Awareness of a possible diagnosis of leprosy in the community is important for promoting early and appropriate help-seeking behavior. Similarly, the awareness to suspect a diagnosis of leprosy is important within the health system, especially as health workers may see few new cases of leprosy. Community awareness as well as the promotion of early case detection and self-referral also can increase the positive attitude of a community towards people affected by leprosy. Messages should be positive, stating that leprosy is curable, that drugs are free to those affected by leprosy, and that there is no place for stigma or discrimination . Surveys of community knowledge and attitudes toward leprosy can help inform the development of information, education, and communication (IEC) strategies . Ensuring the availability of and access to health care and MDT drugs is very important . Particular attention needs to be paid to women, children, migrants, and ethnic minorities. A review of case detection data and audits of equity can be used to demonstrate equality of access to health care and to the diagnosis and treatment of leprosy. The target set by the WHO for the elimination of leprosy as a public health strategy of less than 1 in 10,000 by the year 2000 proved to be effective and was attained at the global level at the end of 2000. However, the challenge in maintaining the momentum and sustainable leprosy programs came after achieving the target. The loss of momentum is clearly seen in the trends of new case detection over the years 2000 to 2006. Despite the benefits of the leprosy elimination target, the use of targets has been criticized . The elimination strategy was very focused on an elimination prevalence target by the year 2000, but had many unsustainable components. Components such as the Leprosy Elimination Campaigns and the Special Action Projects for the elimination of leprosy were resource-intensive activities. Therefore, the global strategy became more sustainable  and became integrated in all its aspects with existing general health services rather than remaining a vertical program . A number of health system approaches to sustainability have been developed in different settings, including linkages with tuberculosis programs, dermatology services, and, more recently, Neglected Tropical Diseases (NTDs) . The primary responsibility for leprosy control lies with national governments, which may have a national program manager for leprosy or coordinate and supervise leprosy services within a department of disease control, communicable disease control, or NTDs. Governments are supported by a number of stakeholders such as the WHO, international non-governmental organizations (NGOs) such as ILEP, and local non-governmental organizations as well as organizations of people affected by leprosy and professional associations such as the International Leprosy Association. Novartis and Novartis Foundation support programs and innovation as well as provide all MDT drugs free of cost. In 2011, the WHO introduced an enhanced global strategy to maintain the focus on sustainability and the reduction in the burden of leprosy . This strategy had a number of new components and focused on the reduction in grade 2 disability in new patients as an indicator of early detection. A target was set to reduce the rate per population of new cases with grade 2 disability by 35%. The purpose was to emphasize early new case detection, by increasing awareness and reducing delay in diagnoses; MDT; and the important issue of preventing disability. The WHO Expert Committee on Leprosy extended this strategy and set a new target of less than 1 in a million population of new patients with grade 2 disability by 2020 at a global level . Future strategies are likely to extend this target to reducing new child cases with grade 2 disability to zero by 2020. Future strategies also will address the issue of gender inequity in the diagnosis of leprosy, an issue highlighted by a recent ILEP report . Integration with other NTDs is an important opportunity for leprosy control. Leprosy shares many cross-cutting issues with other NTDs such as poverty, drug administration, community awareness, stigma, and discrimination, which will provide synergy, financial support, and political momentum for leprosy control . The National Leprosy Elimination Program (NLEP) in Bangladesh achieved elimination of leprosy as a public health problem based on a registered prevalence of less than 1 in 10,000 at the end of 1998, and now aims to achieve this goal at a sub-national (district) level by 2015. The ‘Post Elimination National Leprosy Control Strategy 2011 – 2015’ has been formulated to sustain the achievements and improve the quality of clinical services . The objectives of the NLEP are to provide MDT services in all health complexes at the upazila (sub-district) level and below, to provide MDT to all people with leprosy, and to achieve at least an 85% treatment completion rate (cure rate) among patients who were put on MDT. NLEP also aims to reduce the grade 2 disability rate among newly detected cases to less than 5%, and to implement information, education, and communication activities to increase community awareness about leprosy, promote voluntary case reporting, and minimize social stigma. NLEP also will establish a simple and effective recording and reporting system to monitor progress. Collective efforts have been made to promote awareness for reducing stigma and discrimination against people affected by leprosy, sustaining the interest of policy makers, and encouraging the involvement of general health services and other stakeholders, such as NGOs, in leprosy control. The leprosy elimination activities are integrated into the general health services, and specialized leprosy staff are retained at certain levels to ensure technical support and guidance. General medical practitioners and medical, nursing, and paramedical institutions are involved through training and leprosy orientation activities. For over 15 years, leprosy services in Bangladesh have been delivered through a partnership of government health care services and a variety of NGOs involved in leprosy. This collaboration is organized through the National Leprosy and Tuberculosis Coordinating Committee (LTCC). NGOs have been assigned certain geographic areas to implement leprosy control according to the NLEP guidelines. NGOs provide manpower, training, and technical resources, with assistance from the governmental health services at the national and local levels in terms of clinic facilities, drug distribution, central coordination, supervision, and monitoring. The NLEP has been developed in consultation with all leprosy NGOs and other national and international organizations to achieve a “leprosy-free Bangladesh”. Both the incidence and prevalence of leprosy in Bangladesh have shown a decreasing trend over the past 15 years, but the number of newly detected cases increased in 2014 to 3621, compared to 3141 in 2013 . The number of endemic areas was 15 (13 districts and 2 city corporations) in 1998, but was reduced to only one district (Nilphamari) by the end of 2014. Of all 3621 newly detected cases in 2014, 46% were MB, 38% female, 5.4% children, and 14% had grade 2 disabilities . The estimated prevalence rate in 2014 was 0.23/10,000 population. The NLEP is gradually losing attention on the public health agenda due to reduced funding. MDT is still available free of cost, but the supply of other medicines, the logistics for the management of complications and treatment of leprosy, and the services for the prevention of disability are inadequate. Expertise is difficult to sustain because of a lack of training and capacity building in combination with the gradual retirement of senior staff. Benin is in the West African subregion. In 2014, the population was estimated at 10.6 million , spread over 12 departments. The national leprosy control program, one of the key control programs of the ministry of health, is run at the central level by a national coordination office with focal points in each department. The leprosy supervisors ensure the identification of patients, the clinical management of patients, and the reporting of leprosy control activities in the 77 districts of the country. The data related to the leprosy control activities are collected during quarterly monitoring visits organized by the national coordination office. Health workers, assisted by community intermediaries, are responsible for data collection. Leprosy statistics report sheets are used for case-recording and the data are computerized using Excel 2007 software prior to map conversion using Arc View GIS 3.2 software. Table 3 summarizes the main leprosy control indicators for the period analyzed. From 1995 to 2014, 8460 leprosy cases were detected in Benin . The 20-year follow-up enabled the assessment of the prevalence of leprosy and its distribution at the district and departmental levels. The follow-up also helped in evaluating the work of the Benin National Leprosy Control Program during this period. The highest prevalence rate was recorded in 1997 (1.10 per 10 000 inhabitants). The lowest was recorded in 2014 (0.21 per 10 000 inhabitants). Data analysis by department shows that the Plateau department was the most endemic throughout the period. In 1995, 31 districts had prevalence rates above the WHO elimination target. These districts were concentrated in the departments of Zou/Collines and Atacora/Donga (see Figure 1). In 2014, there were only five endemic districts (prevalence greater than 1 in 10,000) located in Atacora (2 districts), Mono (1 district), Zou (1 district), and Plateau (1 district), respectively (see Figure 2). The improved endemic situation observed in 2014 was achieved thanks to the efforts of the National Leprosy Control Program with the support of the Foundation Raoul Follereau, which organizes detection and treatment using the WHO MDT. Despite the improvement in these indicators at the national level, the new case incidence continued in some departments such as Plateau and Zou. Untreated MB leprosy patients are seen as the principal reservoir of M. leprae. 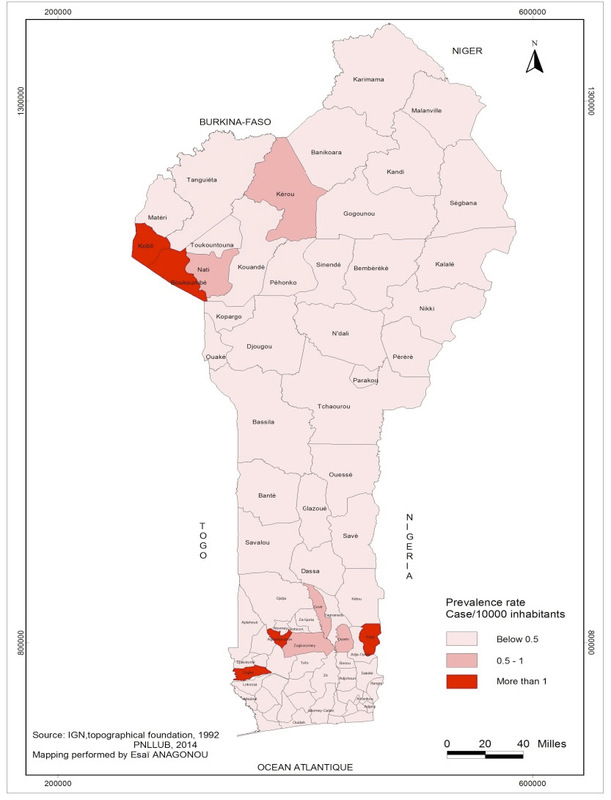 At the start of MDT in 1995, the Plateau department already had the highest prevalence rate (1.04 cases per 10,000 inhabitants), which could explain the persistence of the disease in this district. The analysis also showed a reduction in new cases detected, along with an increasing proportion with grade 2 disability and MB, reflecting a delay in the detection of cases. It is important to implement an appropriate strategy for early detection, such as the MB contact examination. The MB contact examination was designed to investigate the contacts of MB leprosy cases in order to detect new cases of leprosy and to inform and educate those around the index cases on the early signs of leprosy. A list of MB patients was established for the period from January 2012 to June 2014. A total of 294 index cases were identified for home visits and contact examination. Each index case was informed of the day the team would visit, 3054 contacts were examined, and a total of 49 new cases of leprosy were detected. 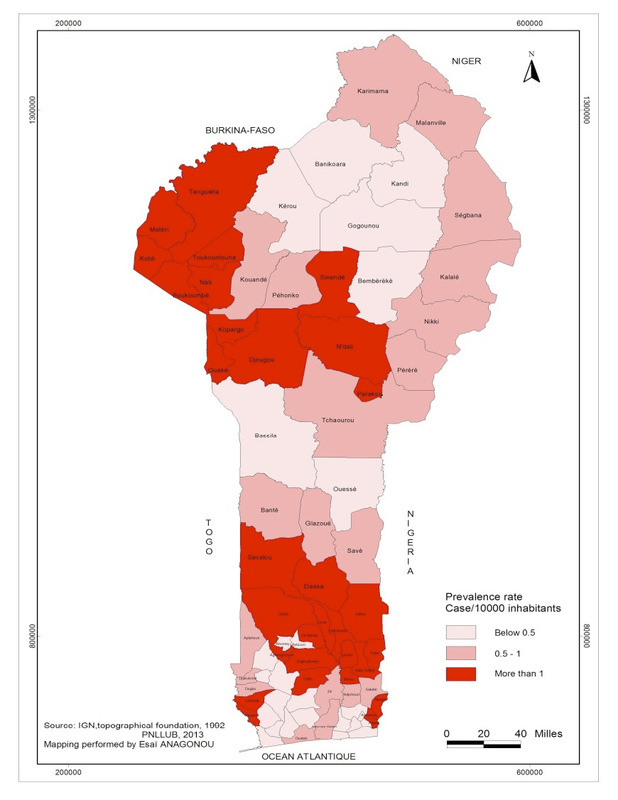 The Benin program is using computerized information on the geographical distribution of and trends in leprosy to develop focused approaches to case detection in endemic areas and districts with persistent new case detection rates. This approach is enhanced by contact surveys of MB patients. The authors would like to express their thanks to Dr. Safir Uddin Ahmed (Ex–Programme Manager, Leprosy, National Leprosy Elimination Program, Bangladesh) for his support and cooperation during the writing of the section on Bangladesh. ^ Richardus JH, Habbema JDF. 2007. The impact of leprosy control on the transmission of M. leprae: is elimination being attained? Lepr Rev 78:330–337. ^ Convit J, Sampson C, Zuniga M, Smith PG, Plata J, Silva J, Molina J, Pinardi ME, Bloom BR, Salgado A. 1992. Immunoprophylactic trial with combined Mycobacterium leprae/BCG vaccine against leprosy: preliminary results. Lancet 339:446–450. ^ Karonga_Prevention_Trial_Group. 1996. Randomised controlled trial of single BCG, repeated BCG, or combined BCG and killed Mycobacterium leprae vaccine for prevention of leprosy and tuberculosis in Malawi. Karonga Prevention Trial Group. Lancet 348:17–24. ^ Gupte MD, Vallishayee RS, Anantharaman DS, Nagaraju B, Sreevatsa, Balasubramanyam S, de Britto RL, Elango N, Uthayakumaran N, Mahalingam VN, Lourdusamy G, Ramalingam A, Kannan S, Arokiasamy J. 1998. Comparative leprosy vaccine trial in south India. Indian J Lepr 70:369–388. ^ Deo MG, Bapat CV, Bhalerao V, Chaturvedi RM, Bhatki WS, Chulawala RG. 1983. Antileprosy potentials of ICRC vaccine. A study in patients and healthy volunteers. Int J Lepr Other Mycobact Dis 51:540–549. ^ Talwar GP, Zaheer SA, Mukherjee R, Walia R, Misra RS, Sharma AK, Kar HK, Mukherjee A, Parida SK, Suresh NR, et al. 1990. Immunotherapeutic effects of a vaccine based on a saprophytic cultivable mycobacterium, Mycobacterium w in multibacillary leprosy patients. Vaccine 8:121–129. ^ Sharma P, Mukherjee R, Talwar GP, Sarathchandra KG, Walia R, Parida SK, Pandey RM, Rani R, Kar H, Mukherjee A, Katoch K, Benara SK, Singh T, Singh P. 2005. Immunoprophylactic effects of the anti-leprosy Mw vaccine in household contacts of leprosy patients: clinical field trials with a follow up of 8–10 years. Lepr Rev 76:127–143. ^ Truoc LV, Ly HM, Thuy NK, Trach DD, Stanford CA, Stanford JL. 2001. Vaccination against leprosy at Ben San Leprosy Centre, Ho Chi Minh City, Vietnam. Vaccine 19:3451–3458. ^ Setia MS, Steinmaus C, Ho CS, Rutherford GW. 2006. The role of BCG in prevention of leprosy: a meta-analysis. Lancet Infect Dis 6:162–170. ^ Zodpey SP. 2007. Protective effect of bacillus Calmette Guerin (BCG) vaccine in the prevention of leprosy: a meta-analysis. Indian J Dermatol Venereol Leprol 73:86–93. a, b Merle CS, Cunha SS, Rodrigues LC. 2010. BCG vaccination and leprosy protection: review of current evidence and status of BCG in leprosy control. Expert Rev Vaccines 9:209–222. a, b Duppre NC, Camacho LA, da Cunha SS, Struchiner CJ, Sales AM, Nery JA, Sarno EN. 2008. Effectiveness of BCG vaccination among leprosy contacts: a cohort study. Trans R Soc Trop Med Hyg 102:631–638. a, b Richardus RA, Alam K, Pahan D, Feenstra SG, Geluk A, Richardus JH. 2013. The combined effect of chemoprophylaxis with single dose rifampicin and immunoprophylaxis with BCG to prevent leprosy in contacts of newly diagnosed leprosy cases: a cluster randomized controlled trial (MALTALEP study). BMC Infect Dis 13:456. ^ Richardus RA, Butlin CR, Alam K, Kundu K, Geluk A, Richardus JH. 2015. Clinical manifestations of leprosy after BCG vaccination: an observational study in Bangladesh. Vaccine 33:1562–1567. a, b, c, d Duthie MS, Gillis TP, Reed SG. 2011. Advances and hurdles on the way toward a leprosy vaccine. Hum Vaccin 7:1172–1183. ^ Geluk A, van der Ploeg J, Teles RO, Franken KL, Prins C, Drijfhout JW, Sarno EN, Sampaio EP, Ottenhoff TH. 2008. Rational combination of peptides derived from different Mycobacterium leprae proteins improves sensitivity for immunodiagnosis of M. leprae infection. Clin Vaccine Immunol 15:522–533. a, b Sampaio LH, Stefani MM, Oliveira RM, Sousa AL, Ireton GC, Reed SG, Duthie MS. 2011. Immunologically reactive M. leprae antigens with relevance to diagnosis and vaccine development. BMC Infect Dis 11:26. ^ Geluk A, Bobosha K, van der Ploeg-van Schip JJ, Spencer JS, Banu S, Martins MV, Cho SN, Franken KL, Kim HJ, Bekele Y, Uddin MK, Hadi SA, Aseffa A, Pessolani MC, Pereira GM, Dockrell HM, Ottenhoff TH. 2012. New biomarkers with relevance to leprosy diagnosis applicable in areas hyperendemic for leprosy. J Immunol 188:4782–4791. ^ Otsyula Y, Ibworo C, Chum HJ. 1971. Four years’ experience with dapsone as prophylaxis against leprosy. Lepr Rev 42:98–100. a, b, c Wardekar RV. 1967. DDS prophylaxis against leprosy. Lepr India 39:155–159. a, b Noordeen SK. 1969. Chemoprophylaxis in leprosy. Lepr India 41:247–254. ^ Noordeen SK, Neelan PN. 1976. Chemoprophylaxis among contacts of non-lepromatous leprosy. Lepr India 48:635–642. ^ Noordeen SK. 1977. Long term effects of chemoprophylaxis among contacts of lepromatous cases. Results of 81⁄2 years follow-up. Lepr India 49.
a, b Noordeen SK, Neelan PN. 1978. Extended studies on chemoprophylaxis against leprosy. Indian J Med Res 67:515–527. a, b Neelan PN, Noordeen SK, Sivaprasad N. 1983. Chemoprophylaxis against leprosy with acedapsone. Indian J Med Res 78:307–313. a, b Neelan PN, Sirumban P, Sivaprasad N. 1986. Limited duration acedapsone prophylaxis in leprosy. Indian J Lepr 58:251–256. ^ Reveiz L, Buendia JA, Tellez D. 2009. Chemoprophylaxis in contacts of patients with leprosy: systematic review and meta-analysis. Rev Panam Salud Publica 26:341–349. ^ Cartel JL, Chanteau S, Boutin JP, Taylor R, Plichart R, Roux J, Celerier P, Grosset JH. 1989. Implementation of chemoprophylaxis of leprosy in the Southern Marquesas with a single dose of 25 mg per kg rifampin. Int J Lepr Other Mycobact Dis 57:810–816. ^ Cartel JL, Chanteau S, Moulia-Pelat JP, Plichart R, Glaziou P, Boutin JP, Roux JF, Grosset JH. 1992. Chemoprophylaxis of leprosy with a single dose of 25 mg per kg rifampin in the southern Marquesas; results after four years. Int J Lepr Other Mycobact Dis 60:416–420. ^ Nguyen LN, Cartel JL, Grosset JH. 2000. Chemoprophylaxis of leprosy in the southern Marquesas with a single 25 mg/kg dose of rifampicin. Results after 10 years. Lepr Rev 71 Suppl:S33–35; discussion S35–36. a, b Blanc LJ. 1999. Summary of leprosy chemoprophylaxis programs in the Western Pacific Region. Int J Lepr Other Mycobact Dis 67:S30–31. ^ Diletto C, Blanc L, Levy L. 2000. Leprosy chemoprophylaxis in Micronesia. Lepr Rev 71 Suppl:S21–23; discussion S24–25. ^ Anomymous. 2011. Epidemiological review of leprosy in the Western Pacific Region, 2008–2010. World Health Organization, Western Pacific Region, Manila. a, b Anonymous. 1999. Proceedings of the Workshop on the Prevention of Leprosy. Pohnpei, Federated States of Micronesia. 25–27 May 1999. Int J Lepr Other Mycobact Dis 67:S1–82. ^ Smith WC, Smith CM. 1999. Preventive treatment of leprosy: needs, opportunities, and feasibility. Int J Lepr Other Mycobact Dis 67:S38–44. ^ Bakker MI, Hatta M, Kwenang A, Van Benthem BH, Van Beers SM, Klatser PR, Oskam L. 2005. Prevention of leprosy using rifampicin as chemoprophylaxis. Am J Trop Med Hyg 72:443–448. a, b Moet FJ, Oskam L, Faber R, Pahan D, Richardus JH. 2004. A study on transmission and a trial of chemoprophylaxis in contacts of leprosy patients: design, methodology and recruitment findings of COLEP. Lepr Rev 75:376–388. a, b, c, d Moet FJ, Pahan D, Oskam L, Richardus JH. 2008. Effectiveness of single dose rifampicin in preventing leprosy in close contacts of patients with newly diagnosed leprosy: cluster randomised controlled trial. BMJ 336:761–764. a, b Feenstra SG, Pahan D, Moet FJ, Oskam L, Richardus JH. 2012. Patient-related factors predicting the effectiveness of rifampicin chemoprophylaxis in contacts: 6 year follow up of the COLEP cohort in Bangladesh. Lepr Rev 83:292–304. ^ Pannikar V. 2009. Enhanced global strategy for further reducing the disease burden due to leprosy: 2011–2015. Lepr Rev 80:353–354. ^ Smith C, Richardus JH. 2008. Leprosy strategy is about control, not eradication. Lancet 371:969–970. a, b Moet FJ, Pahan D, Schuring RP, Oskam L, Richardus JH. 2006. Physical distance, genetic relationship, age, and leprosy classification are independent risk factors for leprosy in contacts of patients with leprosy. J Infect Dis 193:346–353. ^ Moet FJ, Schuring RP, Pahan D, Oskam L, Richardus JH. 2008. The prevalence of previously undiagnosed leprosy in the general population of northwest Bangladesh. PLoS Negl Trop Dis 2:e198. ^ Fischer EA, de Vlas SJ, Habbema JD, Richardus JH. 2011. The long-term effect of current and new interventions on the new case detection of leprosy: a modeling study. PLoS Negl Trop Dis 5:e1330. ^ Smith CM, Smith WC. 2000. Chemoprophylaxis is effective in the prevention of leprosy in endemic countries: a systematic review and meta-analysis. MILEP2 Study Group. Mucosal Immunology of Leprosy. J Infect 41:137–142. a, b, c WHO. 2013. Sustaining the drive to overcome the global impact of neglected tropical diseases. World Health Organization, Geneva. ^ WHO. 1993. Handbook of resolutions and decisions of the World Health Assembly and the Executive Board, vol III, 1985–1992. World Health Organization, Geneva. ^ Centers for Disease C, Prevention. 1993. Recommendations of the International Task Force for Disease Eradication. MMWR Morb Mortal Wkly Rep 42:1–38. ^ WHO. 1982. Chemotherapy of leprosy for control programs. WHO, Geneva. ^ Meima A, Smith WC, van Oortmarssen GJ, Richardus JH, Habbema JDF. 2004. The future incidence of leprosy: a scenario analysis. Bull World Health Organ 82:373–380. a, b WHO. 2011. Enhanced global strategy for further reducing the disease burden due to leprosy, 2011–2015: Operational guidelines. New Delhi. ^ Barkataki P, Kumar S, Rao PS. 2006. Knowledge of and attitudes to leprosy among patients and community members: a comparative study in Uttar Pradesh, India. Lepr Rev 77:62–68. ^ Atre SR, Rangan SG, Shetty VP, Gaikwad N, Mistry NF. 2011. Perceptions, health seeking behaviour and access to diagnosis and treatment initiation among previously undetected leprosy cases in rural Maharashtra, India. Lepr Rev 82:222–234. ^ Lockwood DN, Shetty V, Penna GO. 2014. Hazards of setting targets to eliminate disease: lessons from the leprosy elimination campaign. BMJ 348:g1136. ^ WHO. 2005. Global strategy for further reducing the leprosy burden and sustaining leprosy control activities (2006–2010). Geneva. ^ WHO. 2006. Global strategy for further reducing the leprosy burden and sustaining leprosy control activities (2006–2010): Operational Guidelines. New Delhi. ^ WHO. 2012. WHO Expert Committee on Leprosy, 8th Report. World Health Organ Tech Rep Ser 968. ^ Anonymous. 2014. Post Elimination Leprosy Control Strategy Bangladesh 2011–2015. Ministry of Health & Family Welfare, Dhaka, Bangladesh. ^ Hossain S, Huq NL, Gazi R, Ahmed A, Kabir H, Haque N, Alam S. 2014. Leprosy in Bangladesh 2014: A situation analysis. ICDDR, B, Dhaka. ^ WHO. 2015. Global leprosy update, 2014: need for early case detection. Wkly Epidemiol Rec 90:461–474. ^ INSEA. 2012. General Census of Population and Housing: Summary of findings. Directorate of Population Studies, Cotonou, Benin. ^ Anonymous. 2014. National Leprosy and Buruli control Program Benin (2014). Ministry of Health, Cotonou, Bénin.